Lots and lots and lots! Take a look yourself. After you have accessed Archives Unbound click on “Browse Collections” at the top of the page and you can either browse through an A-Z list of all 265 collections or if you click the “Categories” tab you can browse by subject area. Just some of the subject areas covered are: African American Studies; Asian Studies; Business History; China Studies; Diplomatic History; European History; Holocaust Studies; International Affairs and International Relations; Latin American Studies; Law and Legal History; Middle East Studies; Military History; Religious Studies; Social History; Women’s Studies. I wanted to highlight just a small number of the individual collections to give you a flavour of the type of material available. There are lots more collections than the ones I am about to highlight, covering a wider range of subject areas so do have a look yourself. 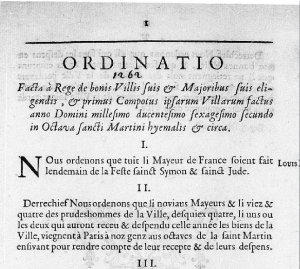 Screenshot of ‘Ordinatio 1262 Facta A Rege De Bonis Villis Suis & Majoribus Suis Eligendis, & Primus Compotus Ipsarum Villarum Factus Anno Domini Millesino Ducentesimo Sexagefimo Secundo In Octava Sancti Martini Byemalis & Circa’ from Actes royaux français, 1256-1794. As far as I can tell this has the oldest material in Archives Unbound. The collection has approximately 16,000 pamphlets covering this period in French history. It’s one of the largest collections of its kind and it offers a wealth of information on the legislative and administrative history of France, as well as other aspects of French life. 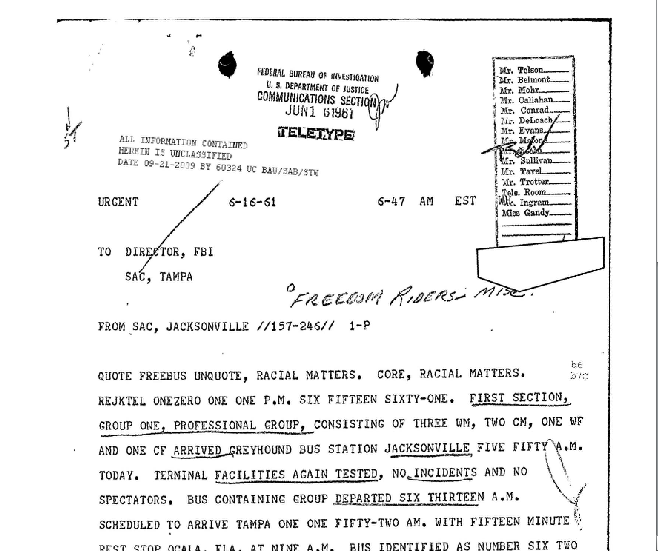 Screenshot of ‘1098929-000 — HQ-157-387 — Section 12’ from Freedom Riders Collection. This collection includes 4,285 pages sourced from the Federal Bureau of Investigation Library. Included are surveillance reports, chronologies, witness statements and more. These materials provide unique (and in some cases recently declassified) insight into the Freedom Rides, the Kennedy administration and the segregated South. This collection reproduces the Tagebuch or journal of Dr. Hans Frank (1900-1946), the Governor-General of German-occupied Poland from October 1939 until early 1945. The journal is in typed format, in chronological order, covering all aspect of Generalgouvernment (GG) administration from its seat in the royal Wawel castle in Krakau (Kraków). The entries reflect administrative matters, rather than the spontaneous thoughts or feelings usually found in a diary. There are a number of collections looking at Jewish history, the Holocaust and events during and surrounding the Second World War including The Jewish Question: Records from the Berlin Document Center, Post-War Europe: Refugees, Exile and Resettlement, 1945-1950, German Anti-Semitic Propaganda, 1909-1941, Holocaust and the Concentration Camp Trials: Prosecution of Nazi War Crimes, Jewish Underground Resistance: The David Diamant Collection, U.S. Relations with the Vatican and the Holocaust, 1940-1950, Japanese-American Relocation Camp Newspapers: Perspectives on Day-to-Day Life, Psychological Warfare and Propaganda in World War II…and there are more available. The earliest texts in this comprehensive collection on witchcraft date from the 15th century and the latest are from the early 20th century. The majority of the material concerns the 16th to 18th centuries, the so-called “classic period.” Included are many rare and fragile manuscripts containing eyewitness accounts and court records of the trials of witches, including harrowing original manuscript depositions taken from the victims in the torture chamber. 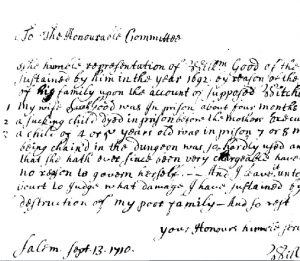 These documents, in both original manuscript and in print, often reveal the harsh penalties of remote doctrinal disputes. Perhaps the most significant of all manuscripts in the collection is the minutes of the witchcraft trial of Dietrich Flade, a sixteenth-century city judge and rector who spoke out against the cruelty and injustice of the persecutions in the 1580s. A year or two ago the Library purchased the Papers of Neville Chamberlain, which proved very popular. Now you also have access to the papers of both his father and half-brother, Joseph Chamberlain and Sir Austen Chamberlain. Covering the period 1836-1914, the Papers of Joseph Chamberlain highlight his political career as Mayor of Birmingham to Secretary of State for the Colonies and the fight over tariff reforms with which he ended his career. This collection demonstrates the rapid change in politics, particularly the constant change in allegiances between politicians and Chamberlain’s own development as a politician. Newspaper clippings of his early speeches, the only record still existing of them, can also be found in this collection, recording his political career from start to finish. Covering the period 1863-1937 the Papers of Sir Austen Chamberlain contains political papers that variously document his policies as Chancellor of the Exchequer, Secretary of State for Foreign Affairs and Leader of the House of Commons. These provide insight into the intentions behind his policies, the development of foreign affairs for both the First and Second World Wars, and his role in the wartime coalition government. 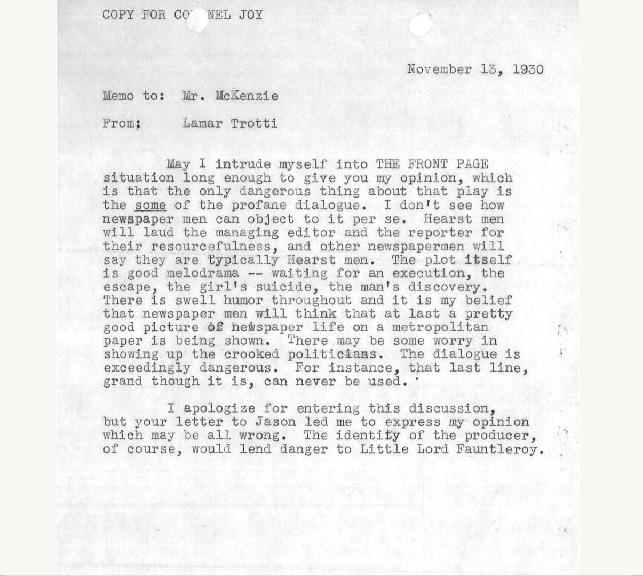 The papers also include personal correspondence with his family, including his sister and wife, and highlight his close friendship with his stepmother, Mary Endicott. A personal favourite of mine, the Motion Picture Association of America (MPAA) Production Code Administration Files collection documents forty years of self-regulation and censorship in the motion picture industry. The Production Code was written in 1929 by Martin J. Quigley, an influential editor and publisher of motion picture trade periodicals, and Reverend Daniel A. Lord, a Jesuit advisor to Hollywood filmmakers. Officially accepted in 1930 by the Motion Picture Producers and Distributors of America (MPPDA), the precursor organization to the MPAA, the Production Code presented guidelines governing American movie production. It is fortunate that when the Production Code was eclipsed by the ratings system the MPAA made the decision to hold on to the office’s files, and eventually agreed to donate them to a library where they would be made available to researchers. 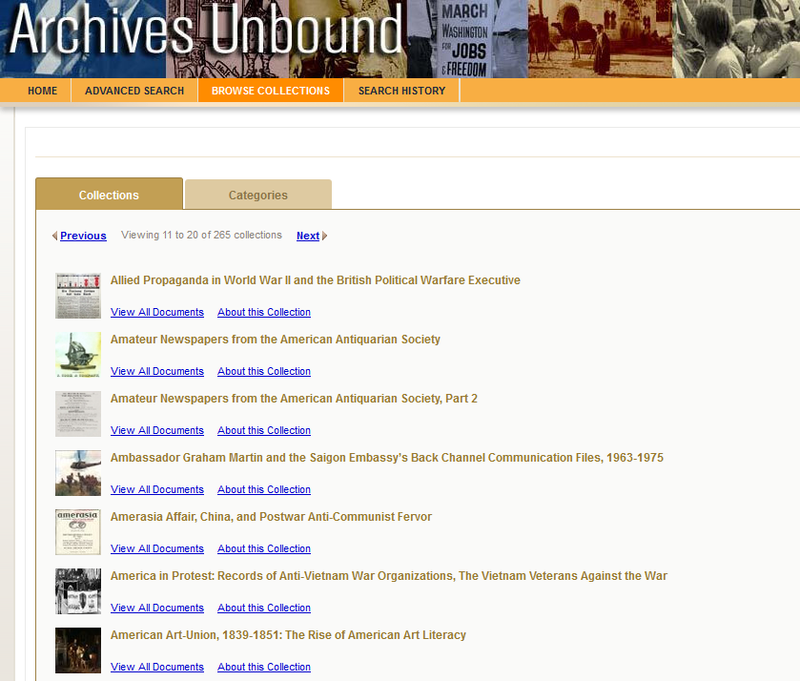 Archives Unbound is a vast primary source database and I have really only touched on a small number of the collections available to us through it. Do take some time to go in and explore and search and see what you can find. The Library currently has a 1-year subscription to this database. During this period we’d be really keen to gather feedback on what you think about this resource – is the content good, easy to use, are there particular collections that are useful, etc? The entries for this database on the Databases A-Z list or database by subject pages have a link to provide feedback, so please do so if you have time. You can access Archives Unbound from the Databases A-Z list and appropriate Database by Subject lists. The Library has already previously purchased permanent access to 9 collections from Archives Unbound and you can find out more about these at Spotlight on Archives Unbound. Access to Archives Unbound is only available to current students and members of staff at the University of Edinburgh. This entry was posted in Library, New, Online resource, Primary sources and tagged archives, Britain, correspondence, Databases, Europe, History, International Relations, journals, Letters, Manuscripts, Politics, primary source, social history, United States, world history by cstirling. Bookmark the permalink.